There wasn’t a recipe, just a reference to the Walnut Street Cafe in Philadelphia. So I googled Khachapuri and read a bunch of different recipes, and then just decided to wing it. It kind of reminded me of the breakfast pizza I tried to make a while ago, with terrible results. But the shape seemed promising. The idea with khachapuri, is that you have a bread boat full of cheese and a lightly cooked egg. You tear off bits of crust and dip it in the melted cheese and yolk. Sounded like a perfect breakfast. The khachapuri bakes at 500 for about 15 minutes and then you add the egg and cook it for 4 minutes more. I couldn’t decide if I was going to add the egg at all until the very last second, but I did, and I’m glad, because it was so delicious. Only one egg slid out of the boat, but I got it back in there quickly with the yolk intact. Everyone thought they were delicious. The boys couldn’t finish theirs so I said to eat the messy part and then I put it in a tupperware for lunch or snack. Luke at he rest of his, but Jack forgot about his, and somehow his tupperware ended up back in the cabinet, and I found half a khachapuri in there 4 days later. Other than that, huge success! A bit ambitious for a school morning though. This entry was posted in food and tagged breakfast, eggs, khachapuri, pizza on November 10, 2017 by metamegan. Any who, last week I saw a cute video about breakfast enchiladas on Facebook and it inspired me. This recipe is very customizable. The night before I made bacon, and I boiled cubed potatoes. I filled the tortillas with bacon, potatoes, cheddar, mozzarella, and scallions. I sautéed peppers but I served them on the side for picky eaters. I rolled the enchiladas and I think I fit 10 in a 9×12 pan. Then I whisked 6 eggs, and a cup of milk* and a tablespoon of flour with some salt and pepper. I poured that over the tortillas and put the casserole in the fridge over night. In the morning I baked it at 400, which may have been too high, but whatever. They were good. I served them with sour cream and salsa. I feel like they would have been better with beans, and salsa mixed in. They were a little dry and bland to be honest, but they felt pretty nourishing for a breakfast. I’m trying something super complicated this week, and I’m already wishing I had some easy casserole in the oven and my feet up. Stay tuned! This entry was posted in food and tagged breakfast, doilies, eggs, enchilada on November 3, 2017 by metamegan. The full name of this recipe, from Food and Wine is Swedish Sugared Sweet Pretzels, which seems excessive and redundant. Call the D.R. Department, as I used to say. (Department of Redundancy Department… I’m sure you got that, I’m just being…redundant.) Anyway – these were really pretty, and everyone liked them. Well everyone except for me. I thought they were a little bland and kind of tasted like I could have made them out of pillsbury dough which would have taken significantly less time. I asked Dave if he was sure he didn’t taste any pillsbury dough flavor and he said, “Maybe I enjoy the taste of pillsbury dough.” I think after all these Fancy Breakfasts my palate is getting more sophisticated. These pretzels have baking powder, presumably so you can make them in 2.5 hours instead of 5 or so. But since I was letting them rest overnight in the fridge that was unnecessary. Now I want to remake them with a better dough recipe. But if I am going to do that… it seems like I should just make the chocolate chips pretzelschocolate chips pretzels because: chocolate. This week I am going savory, and the kitchen smells so oniony. I love onions but no one else does so this should be interesting. This entry was posted in food and tagged breakfast, pretzel on October 27, 2017 by metamegan. We have a little saying in our house that goes like this: Whatever Jack wants, Jack gets. 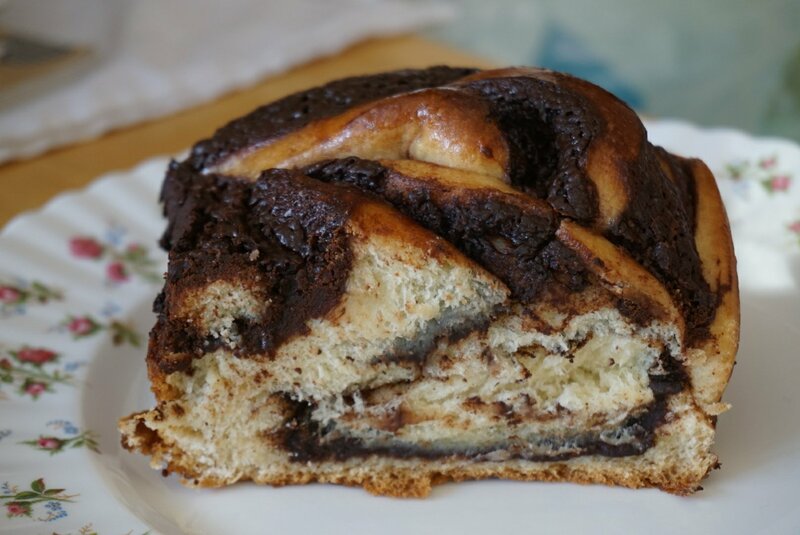 Jack wanted Chocolate Babka, so that’s what I made for FBF last week. The good news is that I used this recipe, from Smitten Kitchen, which was 1000 times easier than the one I used last time. However, it was only 90% as good. So now I am wondering if I should try to take the best parts from each and combine them. Seems risky and complicated. I shouldn’t even post that picture of the bread because it makes it look a little under done on the inside. The judges on The British Baking Show (or whatever its called) would not fully approve. I thought it was very good and very easy to make, and Jack felt like he didn’t get a fair amount of servings, so I will probably make it again soon. I’m in the midst of a baking signup perfect storm where I had to make FBF this morning, followed by muffins for a bake sale tomorrow, and cookies for a mountain bike race on Sunday. Hopefully I won’t burn out and going into another Fancy Breakfast Friday dry spell that’s just full of waffles. Fall FBF is the best FBF. 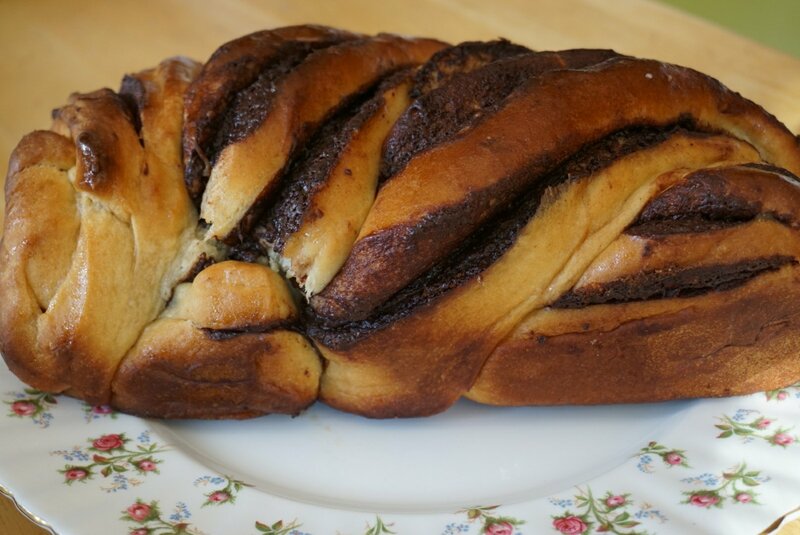 This entry was posted in food and tagged babka, breakfast on October 20, 2017 by metamegan. I made granola bars again. I’m not sure why I am so into granola bars, but I am. I wish I could tell you how to make these, but they are 95% this recipe (but with peanut butter) and 5% this recipe (millet). I served them with bacon and eggs and the boys seemed to love them. I think I planned to take them camping, but I forgot to pack them (along with the butter, coffee and various snacks). They did come in handy as an afternoon snack mid-week when we were completely out of food. In other news, there are 4 left and it’s been a week. I can’t tell if this means they aren’t that great or, since I am storing them in the fridge, it’s an out of sight out of mind situation. Luke seems to love them when they are offered. He doesn’t seek them out. Granola bars aren’t super photogenic, and the lighting in my house is not ideal, especially after dinner on a Thursday night. I decided to photograph them with a stack of books because it’s been a while since I did that and… I am about to reach an exciting book milestone. The Boulder Library does an optional reading history which I LOVE. It’s a list of all the books I have checked out since October 1, 2005. I looked at it this morning and I was at 988. Then I checked out two more books and I am still at 988 so I am not 100% sure how it works, maybe there is some batch process that runs at night? Regardless, I think something exciting should happen when I hit 1000. Maybe I could plan an entire day of drinking coffee while lying in the couch, reading. Or, I could read at a fancy coffee shop, or maybe even at a bar. Obviously reading would have to be a part of it. Maybe I’ll also pay off my fine. I know, it sounds so exciting!! The real question is – should I plan to check out a special book for my 1000th book? Or just let it be random? What book should I check out? 10 or 12 books to go, will I reach 1000 before the end of the year? That picture up there doesn’t even show all the books I have currently checked out, so I think I’ll make it. This entry was posted in Books, food and tagged book, book club, bookclub, breakfast, granola bar on October 13, 2017 by metamegan. Should you be able to stack your bacon higher than your popover? No. These were too short and under cooked. Fail. I tried to remake this recipe that Luke made, and his were so tall! Also undercooked, but TALL! Fancy Breakfast Friday was kind of a disaster, because at some point I realized the popovers weren’t even going to be done before kids are usually finished with breakfast and on to brushing their teeth. So I had to also make eggs and bacon, and they had to cram a popover on their mouth while they rushed around getting ready. This is all part of my new FBF phase where I hope a menu will come to me while I am sleeping. I’m having mixed results. This morning I woke up five minutes before my alarm with this thought in mind, “chocolate banana waffles.” Fingers crossed! This entry was posted in food and tagged breakfast, popover on September 15, 2017 by metamegan. But I have muffins in the oven now, and it’s Friday, so I think I am back in business. A few weeks ago, I made the chocolate peanut butter granola bars because I was so excited to find a recipe that doesn’t have something disgusting in it like dates or coconut. It seemed to have a million ingredients, and I had a tiny bit of each ingredient stored in a bulk bag in my pantry. It was going to be an amazing way to get rid of a bunch of leftover ingredients and also make granola bars for breakfast. Jack asked what I was making the night before when I put him to bed and I said, “granola bars.” He said, “Oh, what if you melted some chocolate and drizzled it over the top, and then, would it be too much to ask for some sprinkles on top?” I said, “We’ll see.” But, you know what they say, “whatever Jack wants, Jack gets.” It’s not so much “they” that say that as “Luke” but you get the idea. I sort of followed this recipe and they turned out great! I obviously put the chocolate on the bars instead of in, and added the sprinkles. I also ground the nuts in the blender to hide them a little. As you can see, I forgot to take a fancy picture, but I was eating a bar while watching the eclipse, so you can see the affect of the eclipse on the light coming through the trees in our yard. So, in the end, pretty fancy after all! This entry was posted in food and tagged breakfast, granola bar on September 1, 2017 by metamegan.